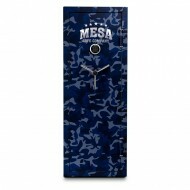 MESA's MBF Series Gun Safes protect your weapons and other valuables from fire and from burglary. 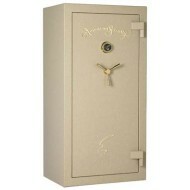 This safe has a one hour fire rating and has a heavy duty construction to deter burglary. 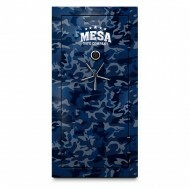 These heavy-duty safes are constructed of all-steel like all Mesa safes. These gun safes are specially designed for those who love to hunt, collect firearms as a hobby and to keep your firearms locked up and secured. Keep your weapons such as rifles, handguns, shotguns, knives, ammunition and other types of weaponry in a heavy-duty and secure safe. Prevent your firearms from getting into the wrong hands. Most importantly, prevent theft and burglary from intruders and thieves from stealing your firearms in your home. The Amsec FV6030E5 was created to be the best economical introductory gun safe you can get. 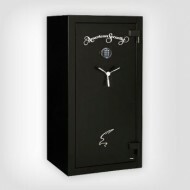 Offering 45 minute fire protection at 1200 F (maintaining an interior temperature of 350 degrees), this safe is great for storing long guns, ammo and all your hunting gear, or if you like, all your computer equipment. 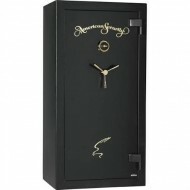 Amsec offers tons of color and accessory options for these safes and we offer all of them. 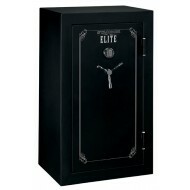 So, if you are looking for your first gun safe, this is it! Please contacdt us if you need indoor delivery on this 610 flb safe please call 877-442-9964 or email customer service cs@thesafestores.com. There is an extra charge. 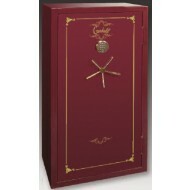 The Gardall GF6030 is a practical guns safe for storage of up to 28 long gun safes. It has both fire protection and burglary protection. It was tested at 1400F (way above the temperature of an average hous fire). In addition this gun safe has an intumescent door seal. Security features include 7 active 1 1/2" bolts, a UL Group II lock with drill protection, four anchoring bolts to bolt the safe to the foor. While not a large model, the GF6030 has the height you need to store long guns (55 inches tall inside). Stack-On gun safes provide high security and peace of mind for those who own firearms. This Stack-On 36 long gun safe has high security features such as a re-inforced door and 7 live locking bolts and 3 dead bolts. 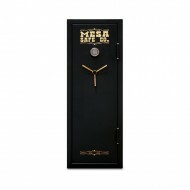 The reinforced door resists drill attacks and the bolts allow 10 points of contact where the door is bolted to the safe. The interior of the Stack-On gun safe is designed for your convenience. It has an adjustible interior. You can set up the interior of the gun safe to hold a total of 36 long guns or you can set it up with side storage shelves if you own fewer guns. Each Stack-On gun safe interior includes patented gun barrel rests and patented stand offs for scoped guns. Stand offs allow scoped firearms to stand upright in the Stack-on gun safe without taking extra space. Inside and out, this is great storage for firearms.